Celebrating its 31st year anniversary, the Jazz Composer Alliance (JCA) has kept true to its roots by providing an active public forum for the presentation of new jazz works. Oct. 1, 2015 - PRLog -- Jazz Composer Alliance announces their 2015-2016 season. The first concert of the season, to be held in mid-October at the Cambridge YMCA, will feature the full JCA Orchestra, performing new and recent compositions by Darrell Katz, Bob Pilkington, David Harris, Norm Zocher, and Mimi Rabson. The full Orchestra at the Cambridge Y will include Rebecca Shrimpton (vocals), Hiro Honshuku (flute/EWI), Helen Sherrah-Davies (violin), Lance Van Lenten (alto sax), Greg Floor (alto sax), Phil Scarff (tenor sax), Melanie Howell (bari sax), Forbes Graham (trumpet), Jeff Perry (trumpet), Jim Mosher (french horn), Bob Pilkington (trombone), Jason Camelio (trombone), Bill Lowe (tuba), Norm Zocher, (guitar), Vessala Stoyanova (vibes), Mina Cho (vibes), Bruno Råberg (bass), Royal Hartigan (drums) Gilbert Mansour (percussion). Jazz Composers Alliance Orchestra Concert, with full orchestra. Sunday October 18, 2015, 3pm. General admission $12, $8 students/seniors. Cambridge YMCA, 820 Massachusette Avenue, Cambridge, MA 02139. Further info. : (781) 899-3130, info@jazzcomposersalliance.org (mailto:%20info@jazzcomposersalliance.org), http://www.jazzcomposersalliance.org/home. Winds, Strings and Mallets; featuring a sax quartet, vocals, violin, and mallets. Presented by Jazz Composers Alliance. Tuesday, December 1, 2015, 8pm. Suggested donation $10. Lilypad Inman, 1353 Cambridge St, Cambridge, MA 02139. Further info. : (781) 899-3130, info@jazzcomposersalliance.org (mailto:%20info@jazzcomposersalliance.org), http://www.jazzcomposersalliance.org/home. Jazz Composers Alliance Orchestra Concert, with full orchestra. Tuesday, February 16, 2016, 8pm. Suggested donation $10. Lilypad Inman, 1353 Cambridge St, Cambridge, MA 02139. Further info. : (781) 899-3130, info@jazzcomposersalliance.org (mailto:%20info@jazzcomposersalliance.org), http://www.jazzcomposersalliance.org/home. Jazz Composers Alliance Orchestra Concert, full orchestra, with special guest Strings Theory Trio. Friday April 29, 2016, 8pm. General admission $12, $8 students/seniors. Eliot Hall, 7A Eliot St., Jamaica Plain, MA 02130. Further info. : (781) 899-3130, info@jazzcomposersalliance.org (mailto:%20info@jazzcomposersalliance.org), http://www.jazzcomposersalliance.org/home. The Jazz Composers Alliance (JCA) was founded in 1985, its agenda including the establishment of an active public forum for the presentation of new jazz works, the creation of the Jazz Composers Alliance Orchestra, and a concert series that included a visiting composers program. Since then, the JCA has released ten CDs, and had created the Julius Hemphill Composition Awards, a competition which ran for ten years, promoting the most interesting and progressive work by jazz composers around the world. JCA also initiated an intermittent outreach program in Boston area schools, which has offered youngsters the chance to create and perform their own compositions with the visiting JCA performers. There have been over 20 resident composers writing for the JCA since its inception. With some of New England's finest improvising musicians in its ranks, the Jazz Composers Alliance Orchestra has premiered over 1200 new pieces by its resident composers, along with commissioned works by Muhal Richard Abrams, Marty Ehrlich and Wayne Horvitz. 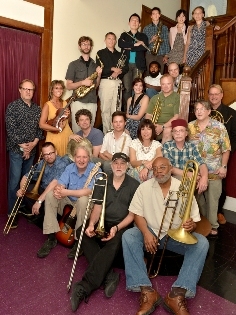 JCA performances have featured collaborations with major jazz recording artists such as Tim Berne, Henry Threadgill, Sam Rivers, Anthony Davis, Bob Moses, Dave Holland, Julius Hemphill, Oliver Lake, Steve Lacey, Ricky Ford, Michael Gibbs, Fred Ho, Maria Schneider, and Dave Fiuczysnki. Hemphill and Rivers can be heard on earlier Jazz Composers Alliance Orchestra albums.